SOS Forum • Minor issue: "Last Visit Was" displaying incorrect date. Minor issue: "Last Visit Was" displaying incorrect date. 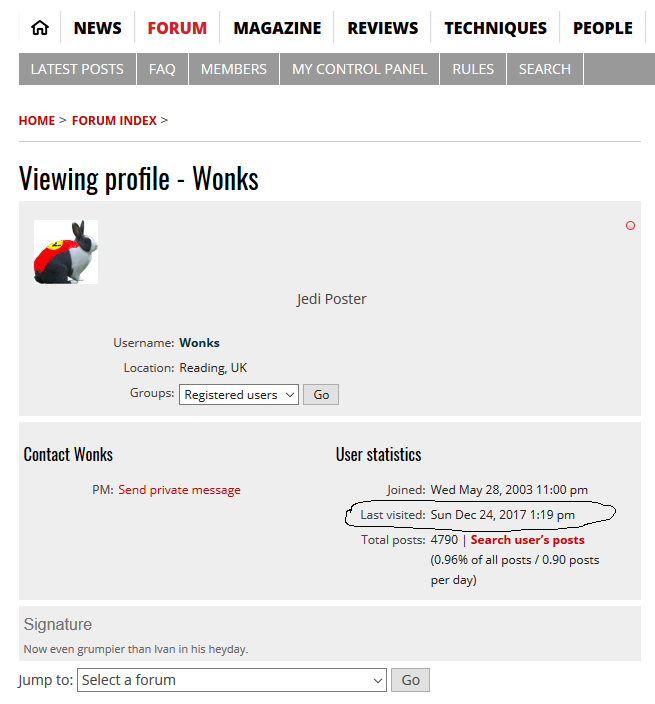 On the main Forum Index page, the line below the Forum Index title has on the right an area saying "last visit was" and then a date. However for me, this says" Last visit was: Thu Dec 07, 2017 6:20 pm", when it certainly wasn't. It's of no major import, but I find it rather annoying. And I'm 100% certain I've had to log on again since then. Re: Minor issue: "Last Visit Was" displaying incorrect date. Ah ha.. Another interesting quirk. I'll mention it to the appropriate people in the new year. It may be quicker to delete it - though for some, it may let them know if someone in their family/friends logged on under their name. Hugh Robjohns wrote: Hope you had a good day. This probably explains why you've forgotten to log into the forum since Wed Nov 29 Hugh. If you went to Wonk's birthday party your mind has probably being somewhat of a blank since then - it was most excellent!! Actually it was on a Wednesday, so very staid. The Friday was the big night. Martin looked stunning in his sequinned outfit and did a very reasonable pole dance. If he remembered to check his underwear afterwards he probably made a pretty decent profit! ... and sometimes I see that the last post on an a thread was by 'X', but when I go to the thread the last post was, in fact, by 'Y'. But if I then go back to the summary/overview the software has caught up with itself. It’ll no doubt be due to the many page caches we run all across the site, with different durations between refresh settings, mixed with how often you wipe cookies... and log out and close tabs etc. by the way, I can’t find any last visited etc in the user profile — screenshot? It's in the 'User Statistics' when you 'View Profile'. @Wonks — ah, OK... I never use that screen myself — assumed you were referring to My Account. The page you get when you click on someone's forum name. I think it updates all the time you're logged in and active. You can view other people's profiles and see how long since they were last looking around on the site (if logged in), if not actually posting. One way to tell if an occasional poster has ever logged back in to check on replies to a post they started.